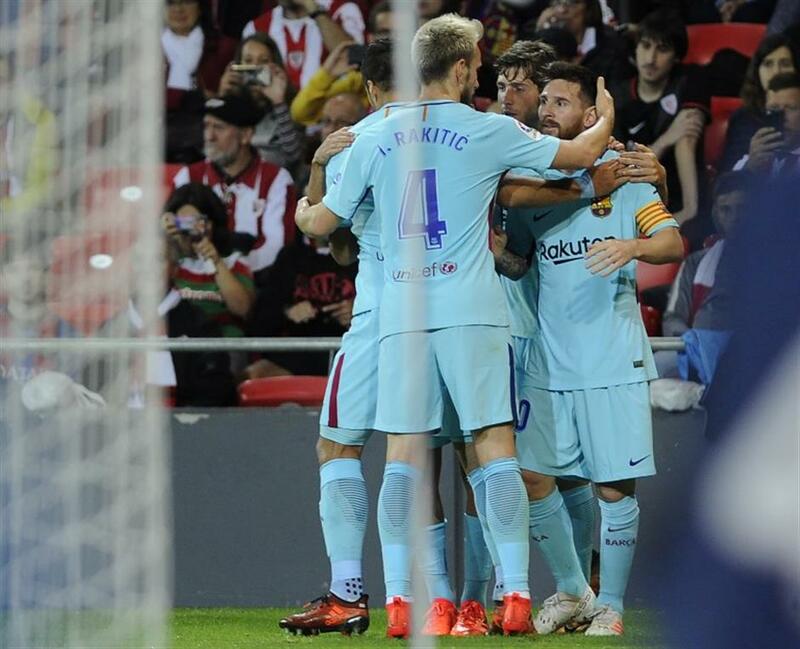 FC Barcelona made it nine wins from their first 10 games of the season on Saturday as they won 2-0 away to Athletic Club Bilbao. Barcelona's Argentinian forward Lionel Messi (R) celebrates scoring his team's first goal during the Spanish league football match Athletic Club Bilbao vs FC Barcelona at the San Mames stadium in Bilbao on October 28, 2017. Barca owed their win to goalkeeper Marc Andre Ter Stegen, who saved several good chances from the Basque side, and Leo Messi, who not only scored Barca's opening goal with just over 5 minutes left in the first half, but also helped set up Paulinho, for Barca's goal in injury time. Valencia made it 6 consecutive wins to retain second place thanks to goals from Simone Zaza and Rodrigo Moreno, which gave them a 2-1 win away to Alaves, who have lost all five games they have played at home this season. Zaza opened the scoring in the 34th minute and although Alexis Ruano levelled five minutes over the break, Rodrigo's 66th minute penalty means Valencia have taken 18 points from 18. Atletico Madrid dropped a further two points following a 1-1 draw at home to Villarreal in which they were guilty of sitting back after Angel Correa's opening goal. Carlos Bacca drew Villarreal level in the 61st minute following a corner, meaning every goal they have conceded has come from a cross into their penalty area that they have failed to deal with. Finally Sevilla got back to winning ways thanks to a 2-1 win at home to Leganes with goals from Wissam Ben Yedder and Pablo Sarabia in a game that was changed in midweek from a 16:15 kick off to 22:30 because of hot weather in the south of Spain.